What can I possibly make for dinner now, when both girls are glued to Iron Chef Morimoto‘s every move? But at least I have decent dessert plans. 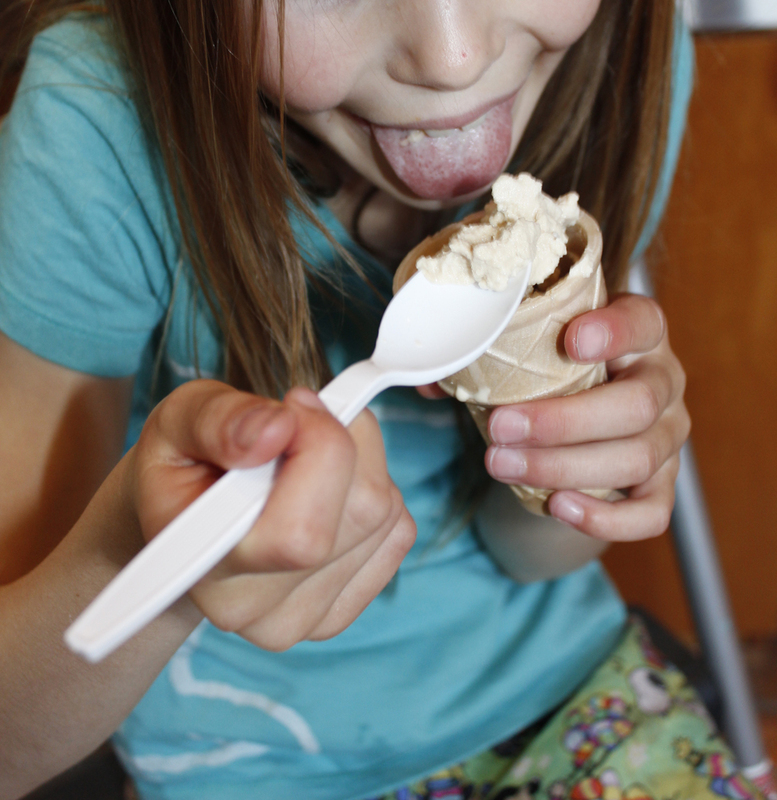 I recently learned how to make delicious homemade ice cream in fifteen minutes or less. Even better, my kids can make it, and the results live up to their sky-rocketing culinary standards. 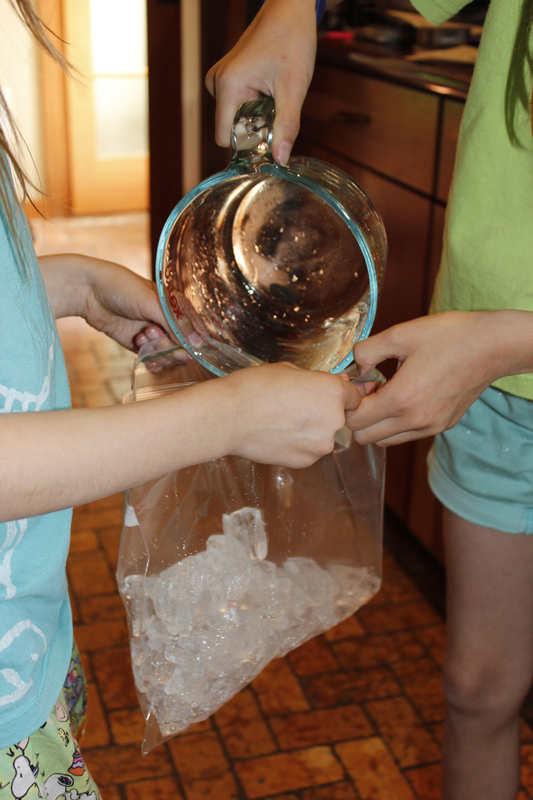 *optional: if you are interested in the science of ice cream, a thermometer for measuring the temperature of the ice, cream mixture, and brine solution. See science notes at the end of the post. 1. 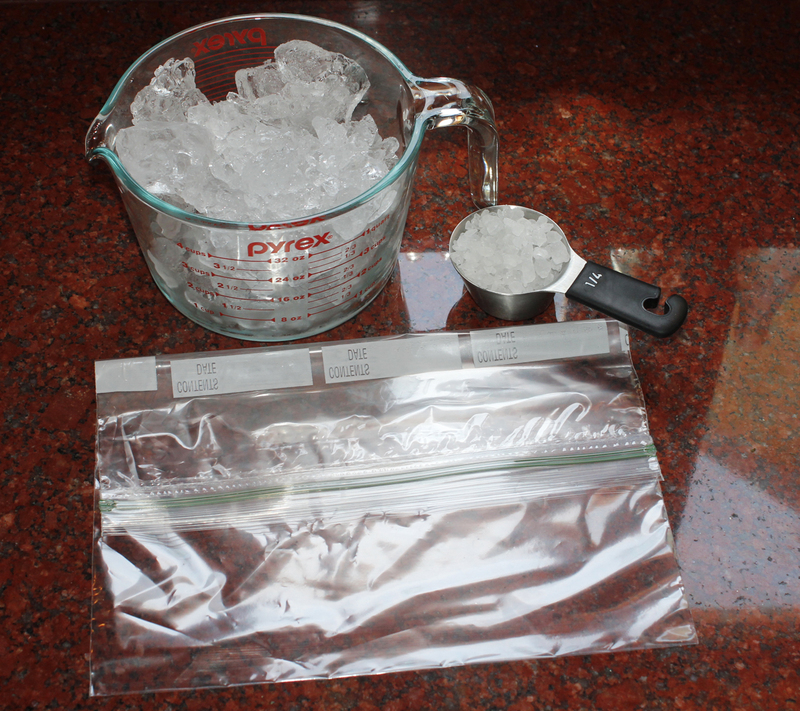 Put the ice and salt into the large ziploc bag and set aside for a minute. 2. 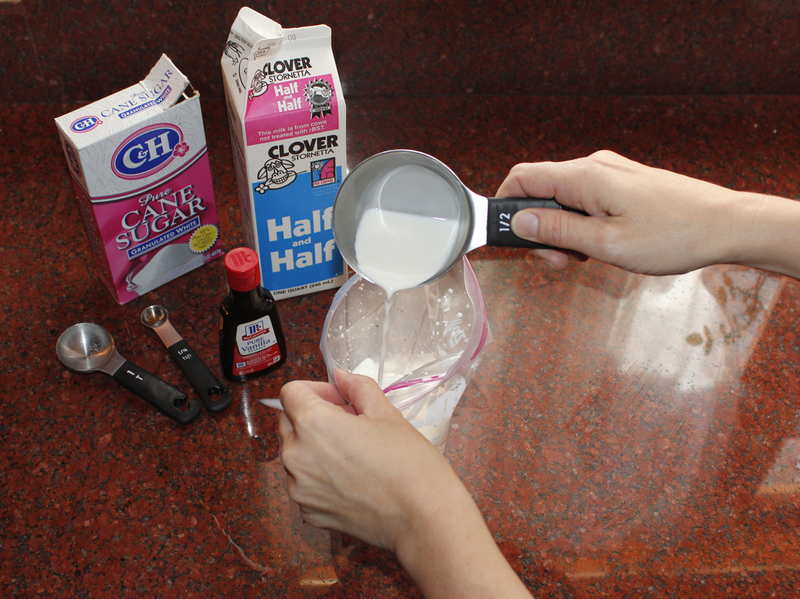 Put the sugar, half and half, and vanilla into the small bag. If the kids are doing this, they need to help hold each other’s little bag open, so the half and half does not spill all over tarnation. This method is for adults only. Kids need someone else to hold the bag. 3. Push out the extra air–preferably without spilling–and seal tightly. 4. 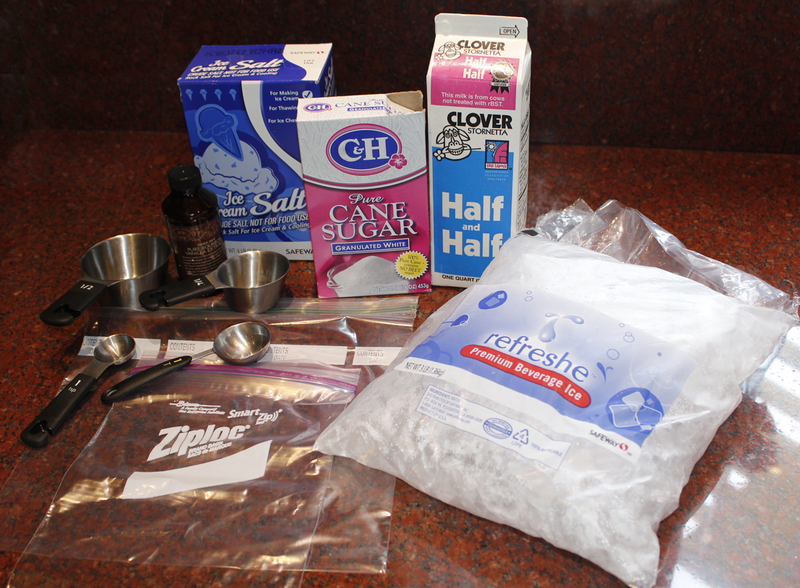 Nestle the small bag into the bag of ice and seal the larger bag tightly as well. 5. 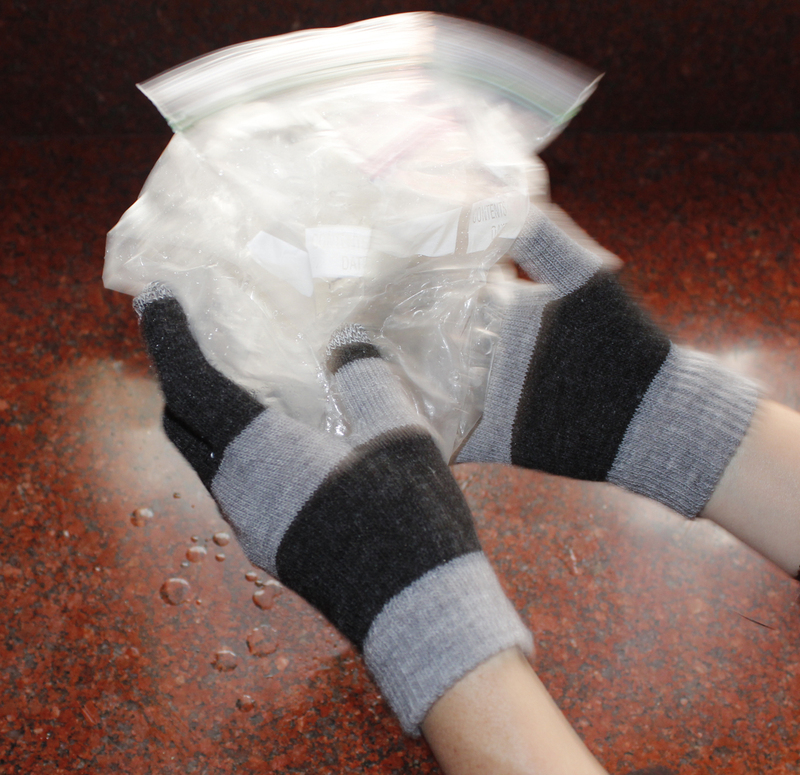 Shake and massage that bag like crazy for about 5 minutes. If possible, go outside. 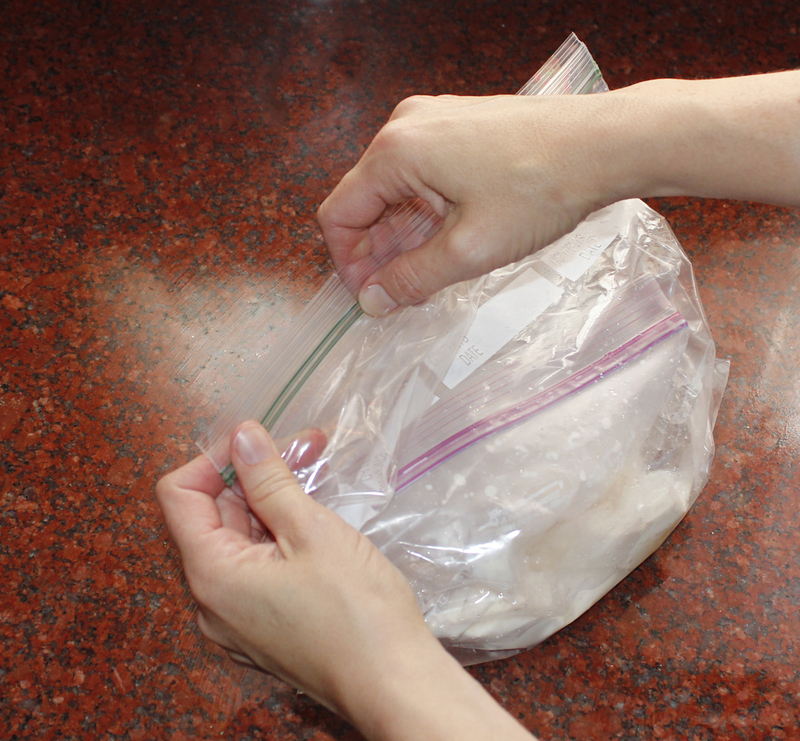 Even if you use an extra bag, there is a lot of condensation that splashes everywhere. As for the gloves, get some. Ice is very, very cold. 6. After a while, you will notice that the half and half thickens and has a solid, peanut butter-like consistency. Time to eat! 7. 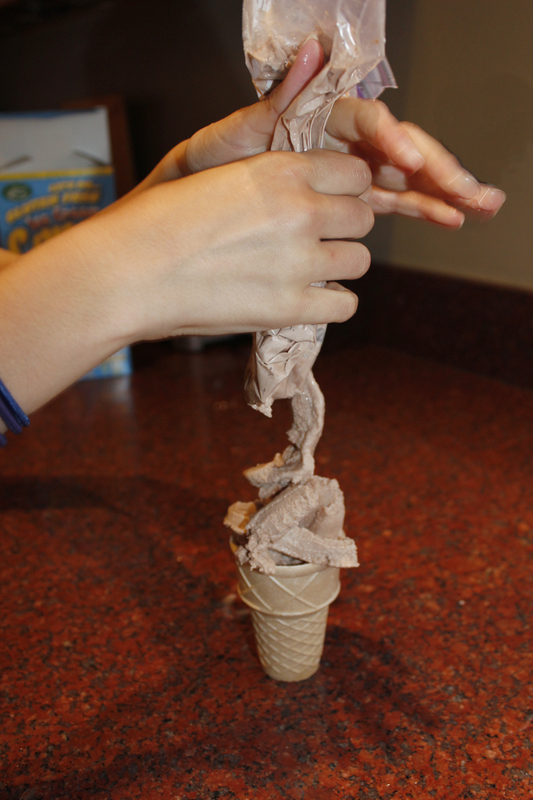 Without opening the small bag, snip a corner and squeeze the ice cream into a dish or cone. Note: you may want to quickly rinse or dry the inner bag before squeezing, so the salty water does not drip into your ice cream. A chocolate variation. See below. Still working on presentation, but this stuff tastes amazing. Variations: we tried adding a teaspoon of instant coffee, which I highly recommend. We also tried cocoa powder. I definitely advise using unsweetened cocoa. 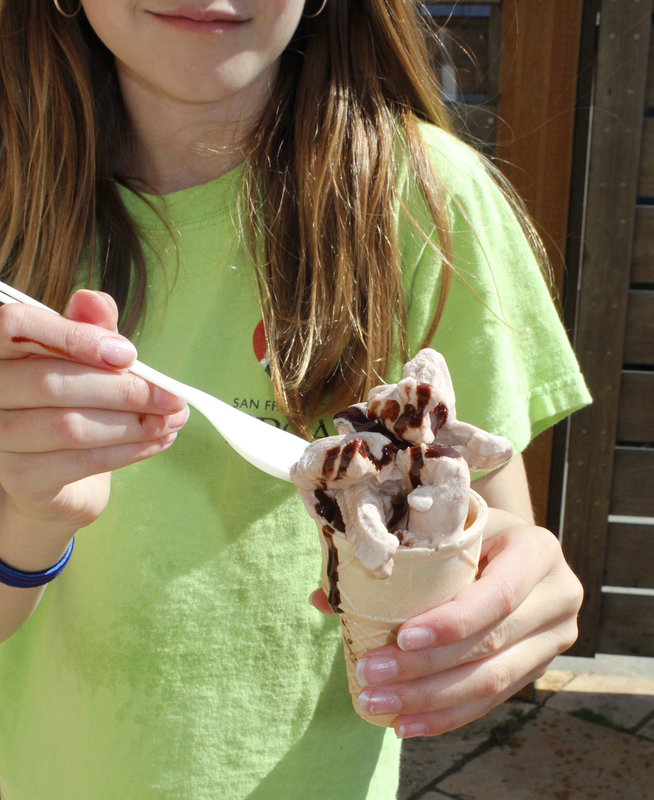 The sweetened cocoa made the ice cream unbearably sweet, in our opinion. We haven’t yet tried fruit, but I think it would work if you mashed it and strained out some of the juice before adding to the bag. Let me know if you try it before I have a chance to do so. Wait, wait! There is a little science going on here, not all of which I can explain in great detail. Ice alone will not work well for this project. Ice is 32 degrees Fahrenheit, and though it could eventually cool the cream mixture to 32, the freezing temperature of the mixture is actually lower than that of water. Consequently, we need to get the mixture colder than 32 degrees in order to freeze! The rock salt melts the ice, and this process lowers the temperature of the resulting brine solution. The heat is then absorbed from the ice cream mixture, bringing the mixture down to about 27 or 28 degrees, where it can freeze. You can read more about it on ehow.